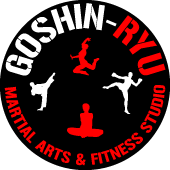 At Goshin-Ryu Martial Arts, we offer an amazing Kickboxing program for people who are looking to get a leaner, meaner, sexier body, get in the best shape of their lives all while having a ton of fun. Our Kickboxing program is an awesome cardiovascular workout that will help you to burn as many as 800 calories in a one hour class. In our program, you get the best of both worlds, with fun and exciting classes that not only teach you the techniques of the professionals, but also give you a great outlet for stress.